You know the score. You go out with your mates, you have a blast, you wake up next morning ... and there's a traffic cone in your flat. How it happens nobody knows, it's one of lifes little mysteries, honest officer! 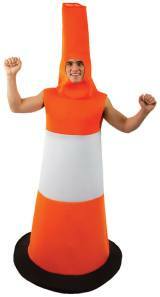 If you want to prevent traffic chaos in your town and encourage others to stay on the right side of the law then a Traffic Cone Fancy Dress Costume could do the trick. This unique, one size costume is designed to fit up to a 44 inch chest and comprises of a bright orange bodysuit with a white central section and black circular base. The cone easily pulls on over the top of the head and the foam padded bodysuit has armholes at the sides. A large base allows you to move around freely and a thin tube which inserts around the base of the cone, ensures a perfectly round shape. Also included is a matching orange headpiece which attaches to the main body piece with velcro at the shoulders for a secure fit. The headpiece has a hole in the middle for your face so you can eat and drink freely.